← High Stress and Low Pay: Would You Do Any of These Jobs? You might have seen the viral post that shows how much people in different countries eat in a week. I was shocked to see how different the types of food eaten as well as the amounts were based on the country the people lived in. Now, Yahoo! recently had three people keep a record of every single thing they ate in a week. Afterward, a nutritionist brought each of the people to a table that showed them visually the foods and the amount they ate for a week. While two of the individuals, Keith and Ella, admitted before the experiment that they didn’t eat healthy, the other one, Kate, felt fairly confident that she ate a healthy diet. I was surprised by just how unhealthy each of their diets were. How Unhealthy Were Their Diets? Keith’s diet was the most shocking. He said upfront that he paid no attention to the nutritional content of what he ate. He had at least 13 beers during the week, in addition to at least a coffee a day. The only fruits and vegetables he ate were one ear of corn, a mini watermelon, one small bag of greens, and a banana. For the week! The bulk of his diet was fried and fast food and white breads. Ella’s diet was full of candy and fried and fast foods like Keith. None of the three got even the base recommendation of 5 fruits and vegetables a day, let alone more. Do you think you eat healthier than you actually do? That is what most of us think, so you’re not alone. Choose one behavior to change every 2 months. Pick one habit to change and focus only on that. If you drink too much soda, choose to give up drinking soda. For 2 months, that’s the only food habit that you change. Once you feel comfortable with that change, in about two to three months time, focus on another habit, like reducing your sugar consumption. Eat healthy first. Another strategy is to eat healthy first. Eat all of your recommended 5 fruits and veggies a day (or more, ideally). Drink your 8 glasses of water. At the end of the day, after you’ve eaten all of your healthy foods, you can still have sweets or fattening foods, if you’re still hungry. Chances are you’ll be full and won’t desire those foods. Even if you do, you won’t eat them in the quantity you previously did. Practice the 80/20 rule. Make sure that 80% of your foods and drinks are healthy and nutritious. The other 20% can be less healthy foods like fried chicken or candy you may be craving. Some people use the 80/20 rule for their daily eating. Other people eat fairly healthy Monday through Saturday and then have a free or “cheat” day on Sunday. What are your recommendations for learning how to eat healthier? I’m constantly trying to eat healthier…..but it’s a struggle each day. I find that if I plan ahead of time (before I pick up a fork) what I’m going to eat for a meal I have a better chance of not over eating. Kind of like going shopping with cash in your wallet….you plan ahead of time what you’re going to spend, and when it’s gone, you’re done! Eating healthy is so much easier in the summer. Between the heat and the farmers markets, I crave fresh fruits and veggies. Winter is harder because I crave more carbs. Implementing small changes is a good idea, like you first point. Taking a “Slight Edge” approach. Also, the 80/20 rule works for almost everything, so I’m glad you mentioned it. Good reminder to keep close tabs on daily food consumption! 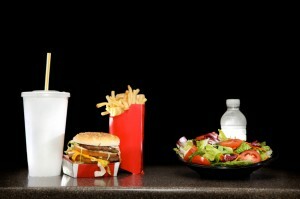 We eat well all week and then have a few “cheat” meals on the weekend–usually Friday and Saturday night dinners. This helps keep us on track with a small reward to look forward to. Now I’m going to count up my fruits & veggies to make sure I’m on target! I strive to follow the 80/20 rule, however I’m probably more in the 70/30 range! I love this! I’m trying to have a healthy diet, I eat lots of fruits and vegetables, but sadly I also eat a lot of meat. Thanks for this tip, I should really take seriously eating healthy foods. I definitely like practicing the 80/20 rule. I also believe that in order to maintain a healthy lifestyle, people need to get themselves permission to eat whatever they want. That might sound bad, but once you give yourself permission to eat what ever you want, you are less likely to eat a bunch of it because you aren’t restricting yourself. Restriction leads to the person only wanting that item that much more.